VISI Blank is an integrated solution for the development of 2D blank shapes from complex 3D models. It is particularly useful in the generation of blank forms for the sheet metal, progressive die, press tooling and crash tooling industries. VISI Blank benefits from seamless integration with the acclaimed VISI Modelling software, using the industry standard Parasolid kernel combined with Hexagon's proprietary surface modeling and 2D design technology. 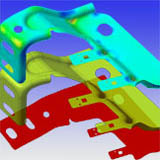 VISI Blank is designed for estimators, engineers, sheet metal product designers and tool and die makers to optimize the development of sheet metal components and provide valuable analysis of material behaviour during the forming process. For the estimator a quick blank representation can be achieved in minutes to highlight potential manufacturing problems, determine material costs and to streamline the production process. 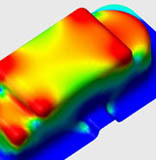 The designer can benefit from the quick analysis provided by VISI Blank to determine areas of a component design which may need to be modified to provide lower manufacturing costs. For the toolmaker, the application is invaluable for identifying areas of a component that will require to be drawn as opposed to multiple forming operations. Graphical representation. Results are provided in a clear and concize graphical display which can be further output to a report sheet format. Graphical analysis includes color coded representation of material areas suspect to 'thinning' and "wrinkling" allowing accurate identification of potential problem areas prior to physical die design. Using the graphical scale the software will identify where the material is within tolerance and any areas that may exceed this.